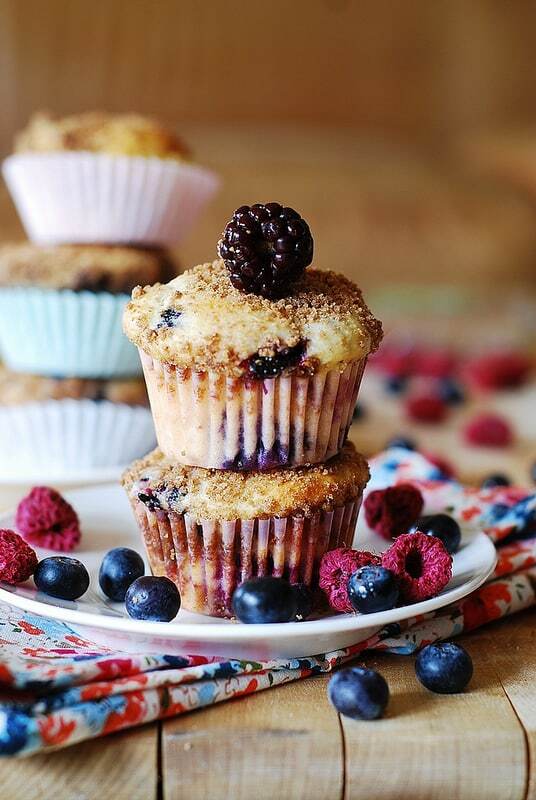 Mixed Berry Greek Yogurt Muffins with blueberries, blackberries and raspberries – fluffy, beautiful texture! Easy to make! What is your perfect summer dessert? What screams “Summer!” louder than a triple berry bundt cake stuffed with all sorts of berries (my favorite dessert from last summer)? Yes, I’ve made that bundt cake many times last summer, but this year I have a new favorite: mixed berry Greek yogurt muffins! Made with Greek yogurt and 3 types of berries (blueberries, blackberries, and raspberries) these muffins are very moist and very much cupcake-like in their texture, and yet they are so refreshing (thanks to all the berries) and very light (only 1/3 cup of vegetable oil used + 2/3 cup of Greek Yogurt). The recipe is easy, and the only crucial thing to remember is not to over mix the batter, otherwise you will end up with a denser and poorly risen muffin. When you combine dry ingredients with wet ones, mix with as few strokes as you can. It’s OK to have some lumps remaining in the batter – the important thing is not to over mix. Use fresh berries, such as blueberries, raspberries, blackberries (it’s summer after all!) and coat them in 2 tablespoons of flour before adding to the batter to avoid berries sinking to the bottom. I’ve used muffin liners for my muffin pan, and you don’t have to grease the pan or muffin liners in this case. If you don’t use muffin liners, use a non-stick spray to spray the entire pan: both muffin cups and the top of the pan so that muffins don’t get stuck and, therefore, remain whole and pretty! As though cupcake-like muffins filled with mixed berries were not good enough as they are, right before putting them into the oven I sprinkled them with streusel-like topping, and they came out of the oven with a perfectly crumbly and crunchy topping. To make a perfect streusel crunchy topping, mix all ingredients (2/3 cup brown sugar, 1/3 cup flour, 1 teaspoon cinnamon, and 2 tablespoons butter, room temperature) with the fork until the mixture has a nice coarse texture. Add more flour if necessary. 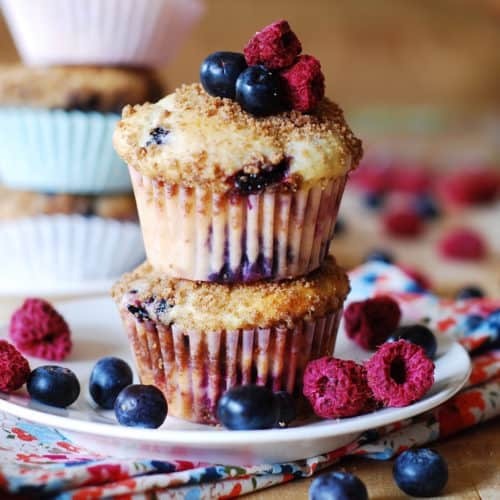 I love this mixed berry Greek yogurt muffin recipe! These muffins were gone very fast: my husband and I ate them for breakfast, as well as for dessert. I can already see how this recipe will work with other fresh fruit, as well as with dried fruit and nuts, and also with chocolate chips. I can’t wait to make many more variations of these Greek yogurt muffins!!!! Mixed Berry Greek Yogurt Muffins are aade with Greek yogurt and 3 types of berries (blueberries, blackberries, and raspberries). 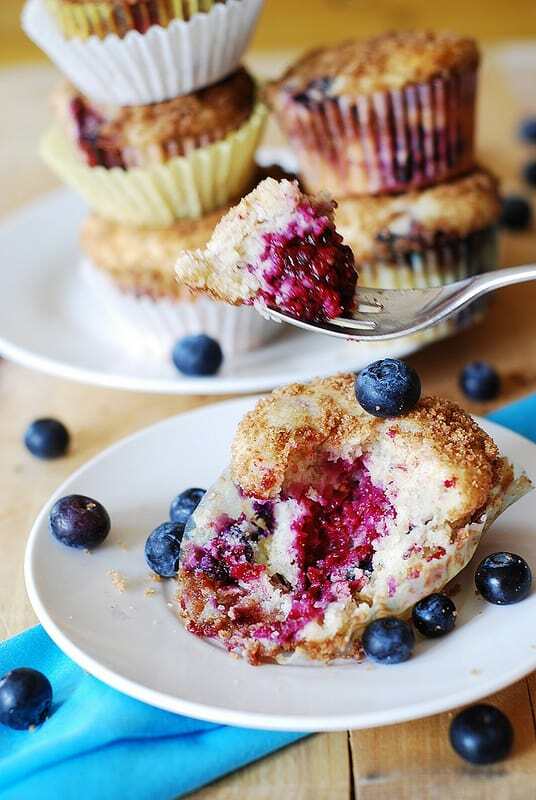 These muffins are very moist and very much cupcake-like in their texture, and yet they are so refreshing (thanks to all the berries). Preheat oven to 400 degrees Fahrenheit. Use one regular size muffin pan (12 muffins). Line muffin cups with muffin liners. In a separate medium size bowl (the one you used in step 2), combine berries with 2 tablespoons of flour. This is supposed to prevent berries from clumping together and sinking. Fold in the berries into the batter. To make the streusel topping, combine brown sugar, flour, cinnamon, and butter in a small bowl. Mix until you have crumb-like mixture. Fill muffin cups with the muffin batter about 3/4 full. Sprinkle the streusel topping over muffins. Bake for about 20 minutes in the oven. Great recipe ! Delicious muffins. A new favourite! In my oven though the baking time was 25 minutes. I made some changes to the recipe based on how our family needs to eat now (recently discovered food sensitivities), and they still turned out great. Here is what I did in case anyone else might be interested: I used Bob’s Red Mill gluten-free flour mix, duck eggs, just 2/3 cup coconut sugar, butter in place of veg oil (though I also considered coconut oil), whole milk greek yogurt, and only a sprinkling of cinnamon and maple sugar as the topping. 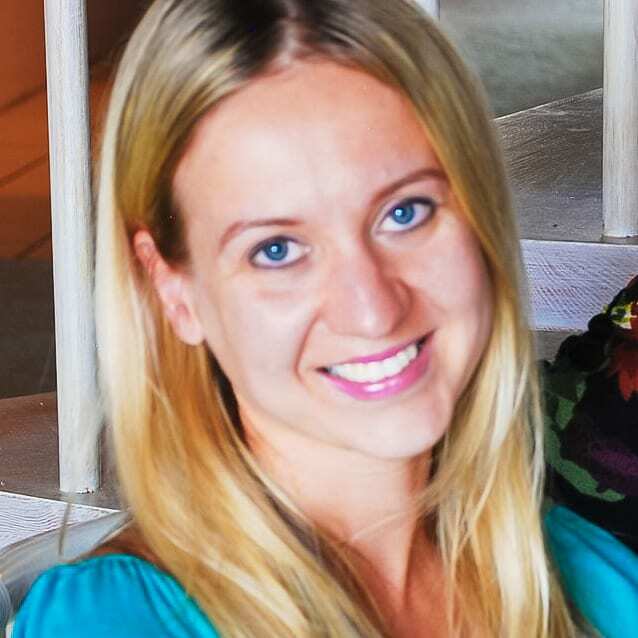 Thank you, Lisanna, for such a great feedback! Great tips for how to make these muffins gluten free. I, too, found the batter to be far too thick. The recipe calls for 2C flour, but I’m wondering if you intended 1C flour? Yes, you use 2 cups of flour. Make sure to sift it or aerate the flour first. Also make sure not to mix the muffin batter too long, otherwise you will end up with dense, poorly risen muffins. If there are lumps in your batter – they will work themselves out during baking. Do not overmix is one of the most important rules when making most muffin recipes!! Hi Patricia, I am glad you tried these muffins! These muffins are really light and fluffy so the dough should not be as thick as you’re describing. Not sure what happened. Did you aerate or sift the flour? Maybe you added too much flour? These muffins are WONDERFUL! My husband LOVES them. Making my third batch of these today to freeze. These go so quickly in our home! Great recipe! You would probably need to make 7 or 8 batches of these to use up all of that streusel topping. 2/3 of a cup of brown sugar? Did you mean 2/3 of a tablespoon? Holy smokes what am I going to do with all of this extra topping? Those muffins are delish!! I mix the plain flour with oats, bran and ww flour…. delicious and soooo easy. Made these these twice in the past 2 days and I and my wife love them. Thank you! Yes, you can. You can even use frozen mixed berry (if it’s in good shape, not mushy, and each berry is separate from another). I’ve used frozen berries in similar recipes with success.